Jeuveau was just FDA approved in the USA as the newest Neuromodulator to join Botox, Dysport and Xeomin. Initially I’ve had some trouble spelling Jeuveau – is it spelled Jeauveau, Jeaveau, or is it Jeauveaux. This is the first time I’ve gotten to hear about it. I’ve been pretty much a Botox injector. I’ve tried Xeomin and Dysport before, and I look forward to trying Jeaveau as the newest neuromodulator. Though, I have to say, that I have been extremely happy with Botox so far. Jeuveau is made by the Evolus company. Welcome to the club! I look forward to figuring out if I like it, if my patients like it, safety, storage ease, comfort, how it looks, and how long it lasts. The above video made by me on YouTube explains “how to make Botox“, well, we’re not making the Botox, we are reconstituting it from a dry Botox form to a liquid Botox injectable form. You could mix it with as much saline as you like. Some would call this dilution, but I prefer the word reconstitution. Dilution implies that we are taking a known dose of Botox and making it a lesser dose. But it works well for me to place 2.5 cc’s of saline into the 100U bottle. This way every 1.0 cc of saline results in 4 Units of Botox. Much of how Botox is injected now involves 4U of Botox in each injection site. 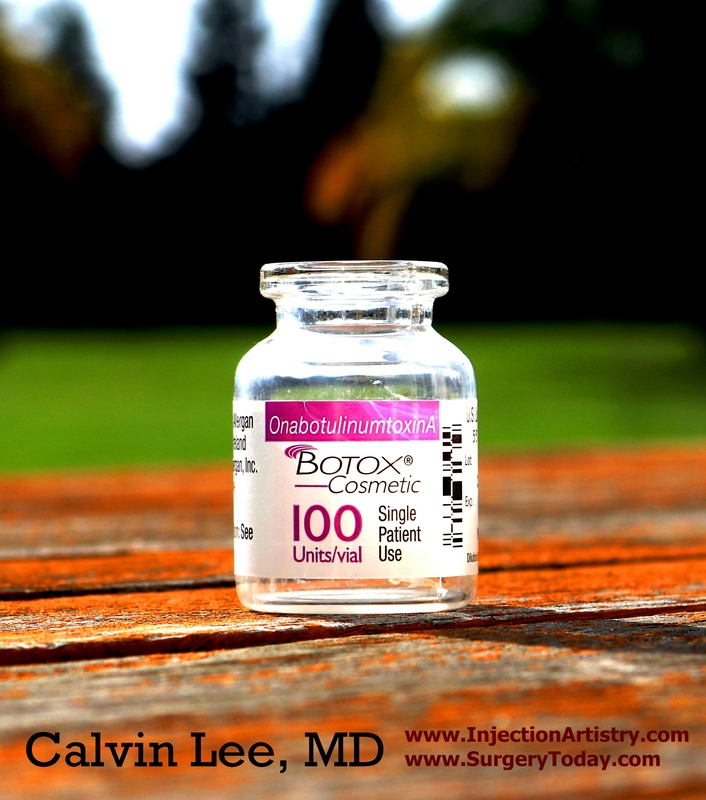 Thus this would be 0.1 cc’s of Botox – and conveniently this shows up on the line in our syringes. Some tips: When inserting a needle into the rubber top of the Botox container, consider using a 21 G needle rather than 18 G needle. Because the 18 G needle might damage the self-sealing aspect of the rubber top. There are always subtleties and the video might give you more insight into the way I do it, which has worked well for me. If you are curious, there are some questions in the comment section of the video. Someone asked where I get my medical degree. It was at Brown University. And someone asked why I wear a mask. I usually don’t talk when I’m reconstituting Botox, and I consider it to be a medication that I’m making that gets injected into a patient, I wanted to make sure I treat it like a surgery – for much of the same reasons – keep the work area from potential contamination. Extra talking creates microdroplets from our mouth into the air. And thus… I prefer to wear a mask if I’m doing some extra talking – for the camera or with a patient while working with Botox. It may be a surgeon thing. It makes me more comfortable knowing that I offered the best for my patients. I hope the info helps. If you are a potential patient, feel free to visit my page about Botox and we are located in Modesto, California. Yes, I do jawline contouring with Botox, Filler, Cannula, Threadlift, and Kybella. I’ve been working with bringing out the beauty of the jawline using multiple techniques. The link above is from a blog I wrote about the subject using Botox in 2015 in my Modesto, CA practice called Surgical Artistry. Some involve filler (ie. Juvederm), Kybella, and threadlifts. However, Botox was one of the earlier modalities that I’ve used for the past 10 years. I use Botox for TMJ and have found that it leads to a slimming effect of the sides of the face. This helps to accent the jawline from the top. I’ve found that it takes a few visits with Botox along the cheek to get the results that we are looking for – usually about 3 visits (spaced about 3-4 months apart). How many Units for Botox in the Jaw area? The amount of units I use vary. I inject in the masseter muscle above the jawline. I use somewhere between 6-40 units of Botox per side depending on the situation. I usually average around 20 units per side of Botox. I have a video where I use what I call a “dice pattern” for injection of TMJ (TMD) – click on the link above to see that injection with Botox. This is a link to my Botox video from 2015. In this video, I inject my father who agreed to be the subject of this video and the background music is that of me playing the violin and Dr. Tammy Wu playing the piano. My Botox technique does change from time to time and I keep trying to get better. Thus the way I inject today may be slightly different than what’s shown in the video. This was filmed on my iPhone on the spur of the moment when my parents came to visit me in Modesto, California. It wasn’t a planned video. I rarely ever plan my videos. I am mumbling and I don’t think I say anything important. And I wanted to attach some of my music to a video to see what that was like. Amazingly the video ends just as the music ends. If anything – I hope you enjoy the music. I’m sorry I haven’t updated much of my webpages. I’m waiting for wordpress 5.0 to come out and see if that would be my editor of choice for the future. For now, visit other great Botox webpages such as the one from allergan. 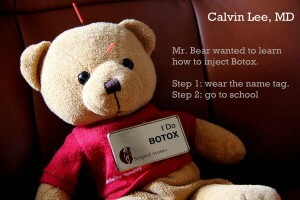 Here’s my previous Botox webpage. Here’s a listing of some of the places to get Botox in Modesto, California. The music in the background is Massenet’s Meditation played by me on violin and Dr. Tammy Wu, plastic surgeon on piano. Do you offer eyelid and eyebrow lifting, Dr. Lee? For a listing of cosmetic services that I offer with Botox, etc. (Calvin Lee, MD), click this link. How long do I have to wait for Botox to work? It takes a few days for Botox to work. It takes 4 days to reach 90% activity. It takes 2 weeks to reach 100% activity. Thus if you feel like you need more Botox, I usually recommend waiting 2 weeks before adding more Botox. This way we see the full effect of Botox before adding more. I do believe in using Botox efficiently (without wasting it on the patient). Surgical Artistry had claim to fame as the office in the United State who had the most patients signed up with the Obagi Premier Points App on their mobile phones. I’m not entirely sure how we did it and I’m not sure that we are #1 anymore with the Obagi App. But way to go to represent Modesto! Thank you Surgical Artistry Team! Regardless, we find it to be something that the patients like very much because the patients get free products shipped directly to them after they earn a certain number of points. Download the Obagi App by going to the App store on your smart phone. We carry the Obagi line of skincare products, we do the Obagi Blue Peel Radiance, and the Obagi Blue Peel. We also carry some of the Suzan Obagi line of products which are all amazing!